Vans Skate x DEFCON Sk8 Hi Notchback Pro and Apparel — strictly waffles. There is a strong case to be made that DEFCON made made some of the best styles of the Syndicate era. Their previous iterations of the Sk8 Hi Notchback are some of the most coveted pairs around. They transcended the usual collector and casual wearer circles and are sought after by military and SOC enthusiasts. It's been awhile since we had a DEFCON model to look forward to, but for Spring 2017, Vans Skate and DEFCON has resurrected the Sk8 Hi Notchback Pro for three new multicam colorways. The pairs will arrive in three new proprietary Multicam® patterns: Arid™, Tropic™, and Black™. The collection has an array of technical advancements that are usually reserved for deployment in the uniforms of the world's militaries. Each patterned material itself is specifically designed to reduce the visual and near-Infrared signature of a person in three distinct environments. In addition, each shoe features premium waterproof and flame retardant Wolverine Pig Suede®, water-resistant treatment on uppers, special Multicam® Nylon textiles, Dri-Lex™ moisture management linings throughout, gusseted tongues, Vans Ultracush HD footbeds with custom branded artwork, and durable reverse lug outsole and knurled texture foxing tape. 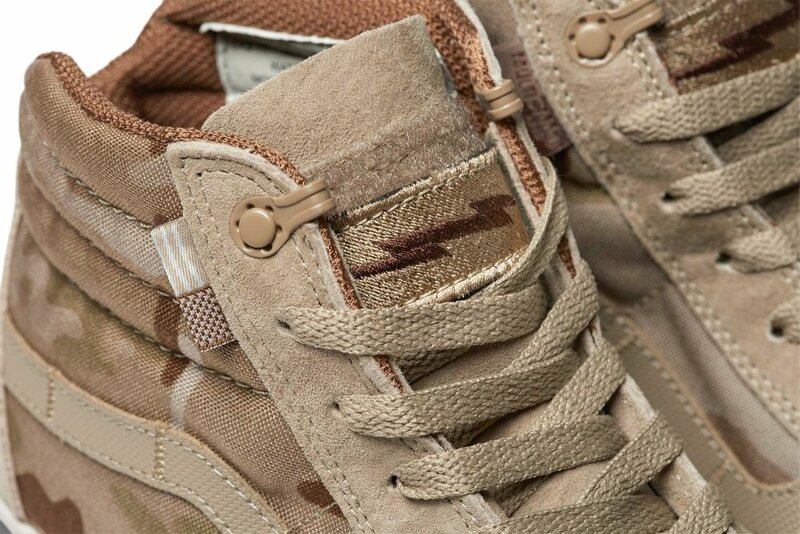 Each shoe will also feature removal DEFCON bolt logo morale patches on their tongues. Custom woven subdued American flag tags mimic the shoulder patches worn on the uniforms of LEO's and US Soldiers, Sailors, Marines, and Airmen. On each heel, a hesh goat embossed heel stamp can be found which finishes off the detailing of every pair. Alongside the footwear, three tees are releasing with DEFCON branding in complimentary coloring to the shoes. The Vans Skate x DEFCON Sk8 Hi Notchback Pro and Apparel will release at select Vans Pro Skate stockists this Saturday, May 27th for $110. Visit Vans.com/skate to find authorized dealers near you.